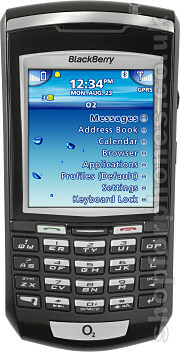 The RIM Blackberry 7100x is a compact Blackberry device, exclusively available on the O2 network. Like other Blackberries, the 7100x excels at messaging with strong email capabilites and great personal information management (PIM) functionality. Narrower than Blackberry devices with a QWERTY keyboard, the layourt on the 7100x combines the ease of use of a traditional arrangement with the compactness of a numeric keypad. Using a technology called SureType, text entry on the 7100x is very easy, allowing long emails to be typed without much effort. The size of the 7100x also makes it easier to slip into a pocket when not in use. There's a large, exceptionally clear transflective display in 240x260 pixels, Bluetooth, quad-band GSM support, GPRS and a capable web browser, in addition to a flexible email client. Standby time on the Blackberry 7100x is up to 8 days, and email and web browsing functions use relatively little power. The 7100x's four hours talktime should suit most people too. Available in January or February 2005 on the O2 network. Please subscribe to our newsletter for updates. If you want more information on the RIM Blackberry 7100x, 7100t & 7100v, subscribe to our mailing list. Also, the Update newsletter contains general news about new phone releases.